Measuring fuel consumption offers economical and ecological opportunities to improve the operational fuel efficiency of ships. Therefore, ship owners are focused on fuel consumption management and seeking optimum ways of using the ship‘s fuel bunker. Since decades, Hoppe Marine has been engaged in the development, installation and upgrading of fuel consumption measurement systems by offering harmonized hardware and in-house developed software. From small supply vessels to ultra large container ships, our fuel consumption monitoring system is fully adjustable for any type of fuel scheme and is designed to meet all customers’ requirements. Our partnership with specialists in the field of instrumentation and process automation allow us to make use of high-level performing components and to deliver more complex requirements when needed. 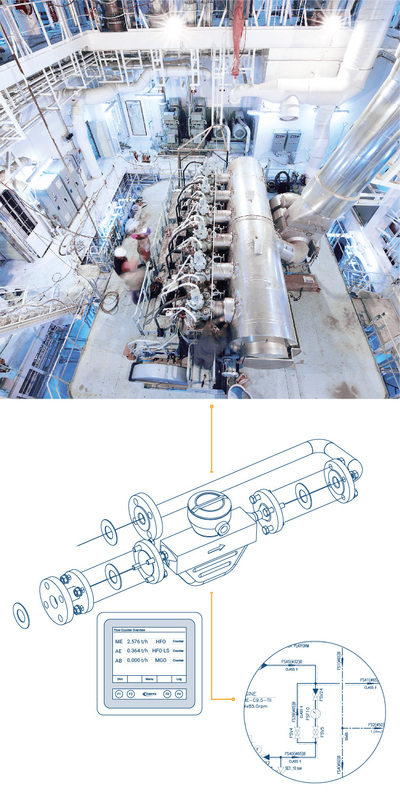 The fuel consumption measurement system primary consists of our Control Unit (HOMIP) and mass flow meters operating on the “Coriolis principle”. Additionally and depending on the customers’ application, further fuel consumption optimization modules such as Navigation can be connected to the system to provide all features necessary for precise long term consumption. Nearly all existing flow meters can be intergraded to become compatible with our system. The Coriolis principle allows the flow of mass to be directly measured. A pair of tubes is located inside each Coriolis flow meter. An exciter causes these tubes to oscillate constantly. If there’s no flow, the measuring tubes are oscillating uniformly. Sensors are located at the inlet and outlet and register this oscillation precisely. As soon as the fluid starts to flow in the measuring tubes, additional twisting is imposed on the oscillation as a result of the liquid‘s inertia. Due to the Coriolis effect, the inlet and outlet sections of the tubes oscillate in different directions at the same time. The sensitive sensors pick up this change in the tube oscillation in terms of time and space. This is known as the “phase shift” and is a direct measure of how much mass is currently flowing through the pipe.